No booking, get there in good time! 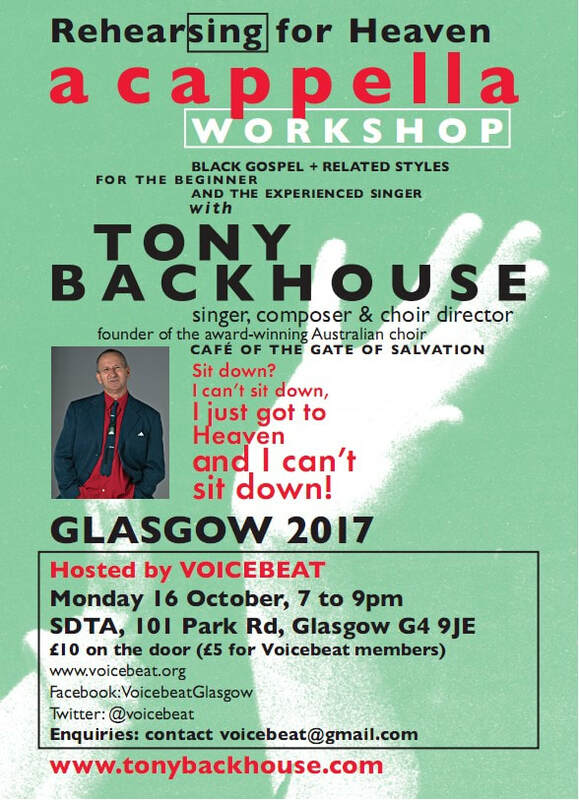 A cappella gospel with Tony Backhouse – Tony has led nine gospel tours to the USA to participate in the African American church tradition. He has run vocal workshops in New Zealand, Australia, the UK, Canada, France, Italy, Fiji and Samoa and was one of the founders of the Sydney A cappella Association. He is the author of two songbooks ‘A cappella • Rehearsing For Heaven’ and ‘Move On Up’, and a book on directing vocal groups ‘Freeing the Song’. Tony works with the passionate and exciting African-American repertoire, focusing on spirituals, gospel songs old and new, choral and quartet styles, and embracing South African church songs, and often doo-wop, R&B and pop. The emphasis is on harmony, collective improvisation and freedom of expression. No music-reading skills are required, and you may record the sessions.